A real rarity: Tokaji made from 100% Muscat Lunel grapes, the hardest to grow and most sensitive grape variety of the Tokaj region. Top 10 wine of the 2007 VinAgora Botrytis wine competition, and Gold in Paris. 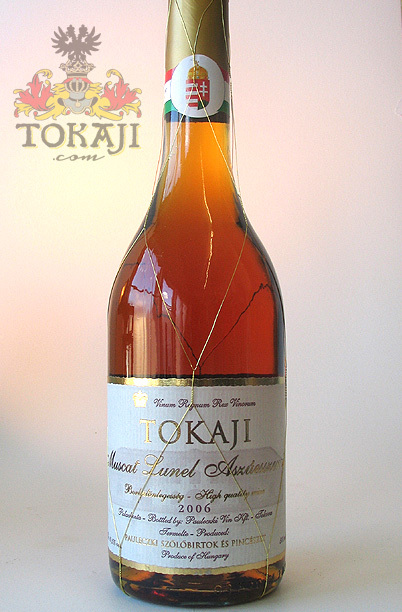 The Muskotályos Aszú is a speciality in Tokaj Hegyalja, it is made from Muscat Lunel grapes only. This wine is a rarity, because the Muscat Lunel is a very sensitive grape and harder to grow than the Furmint. Otherwise, Muscat Lunel is very susceptible to Botrytis cinerea. Classical Aszú contains normally not more than 5% of Muscat Lunel and adds an aromatic bouquet to the Aszú especially in its younger years.